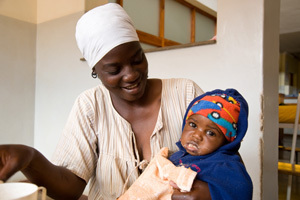 Caritas works with mothers and children and HIV affected people in Zimbabwe. At little over half way to Mumbai on the congested National Highway 8 from Delhi lies Aslali, a major transport hub on the edge of the smoggy city of Ahmedabad. This is the commercial heart of western India and the country’s fastest growing, and most polluted, city. Each day, 5,000 trucks and their drivers pass through. It makes Aslali the perfect spot for an outreach health centre for counselling and testing for HIV: in its ﬁrst month alone, 50 truckers came for ward. As word spreads, the project aims for 6,000 a year. The centre is a pioneering private-public partnership supported by Caritas India, and is part of its creative work around HIV/AIDS. A cross country drive on National Highway 4 leads to Chennai, where 15-year old *Aditya movingly describes his story of anger and alienation from his parents to staff members at another Caritas India outreach project. This one is training young social workers as grassroots advocates for better testing and medicines and for an end to stigma and discrimination. Aditya describes suffering from severe depression after discovering the pills his parents were giving him were for HIV; they had not been able to bring themselves to explain that he had been infected by a blood transfusion. Life skills training and counselling by a Caritas India partner has now helped Aditya recover and repair his estrangement from his parents.